Today we are in luck. In less than seven months we have our App available on Google Play, we have reached 1,000 downloads. Our App is also triumphing in the Apple Store, since we have more than 2,000 downloads in less than seven months. We thank these more than 3,000 people who have already relied on Quotizando to carry out their queries for quotations in the different markets, and we encourage them to continue using our App. This week we have incorporated into our App a powerful currency / coin converter in real time. Coin converter: Conversion of 1,000 dollars to six classic coins and five crypto coins, simultaneously. 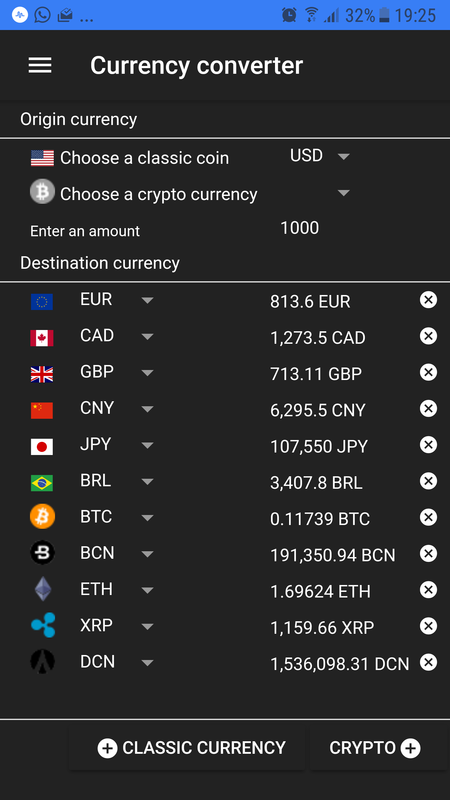 This converter combines in a very efficient way the quotation of the most important classic currencies of the world with the quotation of the most relevant crypto-medals, so that we can make all the combinations that we need to calculate the equivalent of any amount in any currency. You can see the full functionality of the App in this link. Today we are in luck. In less than two months we have our App available on Google Play, we have reached 200 downloads. Our App is also triumphing in the Apple Store, since we have more than 250 downloads in less than two months. We thank these more than 400 people who have already relied on Quotizando to carry out their queries for quotations in the different markets, and we encourage them to continue using our App. Today we are in luck. In less than a month we have our App available in Google Play, we have reached 100 downloads. We thank these 100 people who have already relied on Quotizando to carry out their quotation queries in the different markets, and we encourage them to continue using our App. Today we are in luck. In less than a month we have our App available in the Apple Store, we have reached 100 downloads. Today we have put into production, on Google Play, the first version of our App. We are very excited about this new journey that we hope will have the support of many of you.